A photo-finish is being predicted between President John Agyekum Kufuor and Prof. Evans Atta Mills in this year's presidential election which may precipitate a second round, a survey conducted by GhanaWeb (read), a Ghanaian website between March 21 and 24, has indicated. The result, if it really reflects public opinion, would represent a rematch of the 2000 presidential election and thrust the balance of power into the domain of the smaller parties once again. 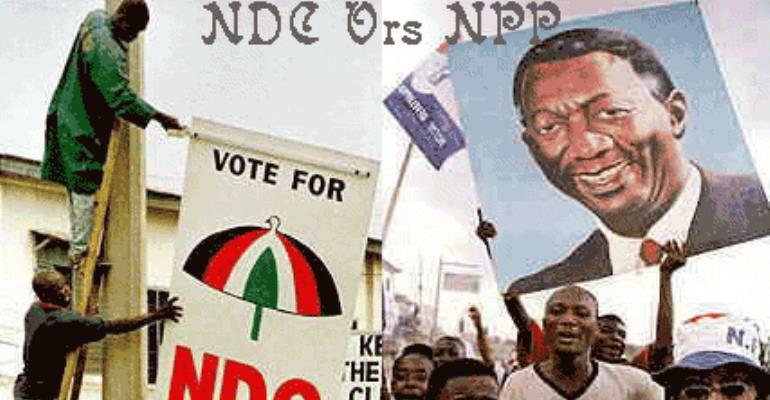 It recorded a total of 2,860 votes, 49.9% of who said they would vote for the incumbent, Mr. Kufuor's New Patriotic Party (NPP)) whiles 43.7% said they would vote for Prof. Mills' National Democratic Congress (NDC). Dr. Edward Mahama, though not yet selected as the presidential candidate of the People's National Convention (PNC), placed third with 2.4% of the votes cast. A percentage of 2.2% was given to any other candidate who would contest the presidential election, including an independent candidate. Mr. George Aggudey of the Convention Peoples Party (CPP) and Mr. Dan Lartey of the Great Consolidated Popular Party (GCPP), both presidential candidates, took the rest of the votes, receiving 1.0% and 0.7% respectively. From the figures, election experts say the minority parties, excluding the NDC, would be great determining factors in this year's election. But the two major parties – NPP and NDC – thought otherwise when The Chronicle contacted them on the effectiveness of the survey. The youth secretary of the NPP, George Assiamah said the survey was an elitist exercise and did not reflect what was actually on the ground because it did not take into account the people at the grassroots. He said with the record of good governance, infrastructural development, crime reduction, stable economy among other achievements that the country had experienced under the NPP administration, the president would win massively with about 60% of the votes. The national youth organizer of the NDC, Haruna Iddirisu also thought the survey did not capture the rural dominance of his party in the political landscape. Reacting to the assertion by the NPP that it would win about 60% of the votes, Mr. Iddirisu said no candidate in the political history of the country had won with 60%. He said in case the election went into second round, nothing but a win for Prof. Mills should be expected. He predicted that the NDC candidate would win 53% of the votes because the electorate had realized the NPP government's story of deceit, corruption and abuse of power. The general secretary of the NDC, Dr. Nii Josiah Aryeh, told the paper that the survey represented the views of the educated class which had a dominance of NPP members. “I don't believe it takes account of what is going on at our grassroots and the rural areas,” he stressed.